Goose-neck mouldings are, in my opinion, the great equalizer in any discussion of moulding planes or power tools for curved designs. Sure straight runs of moulding can be made using hollows and rounds, but the curved mouldings are a completely different animal. 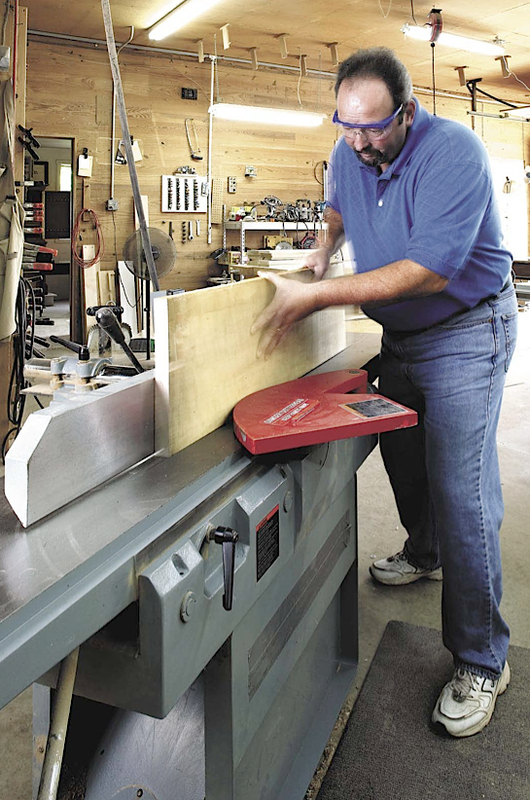 With goose-necks, you better be thinking kindly about a router, router table or shaper. And, you probably should have a selection of carving tools if your design has a rosette and doesn’t return on itself (as shown in the above photo). 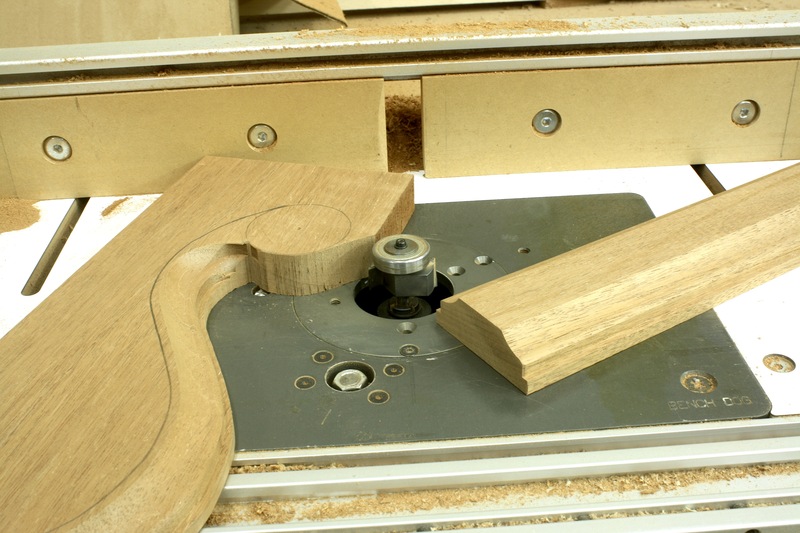 The best way to run these profiles using a router is with the face of the goose-neck moulding facing up. 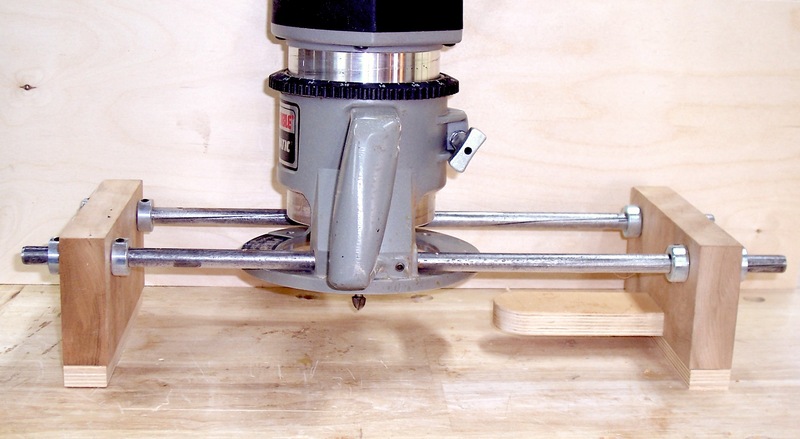 To do that you need an over-arm pin router setup, or you need to create a method to hold your router above the workpiece as you guide the cut, as shown to the left. 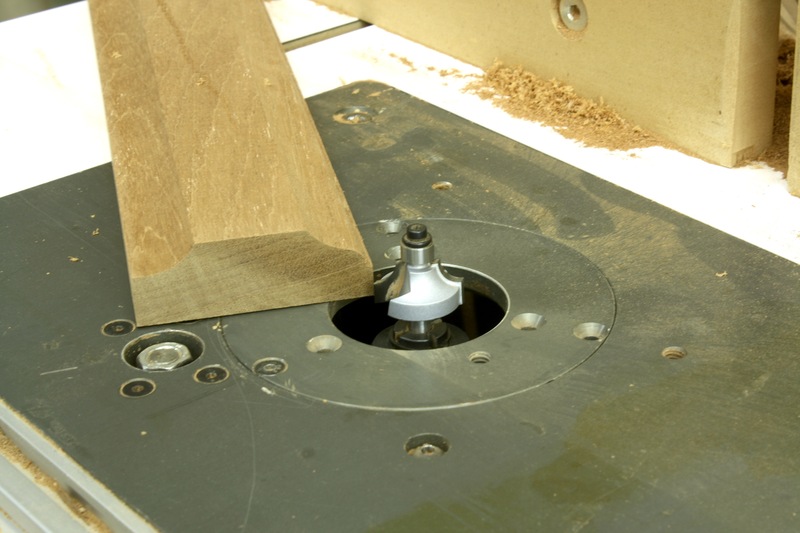 This setup uses the guide-fence holes and scrap pieces to raise the router cut abilities. The setup is easy to duplicate, but using the arrangement is not that simple. You need to accurately guide the router along the curved lines of the goose-neck while holding things at 90° to the workpiece. Slow and steady wins the race, but even then you have clean-up work to do. 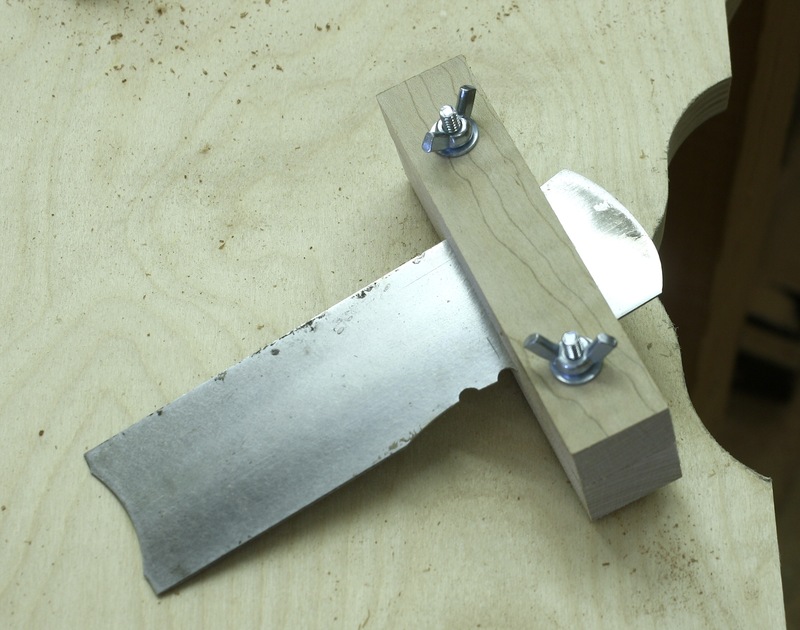 It is much better if you can use bearing-mounted router bits. 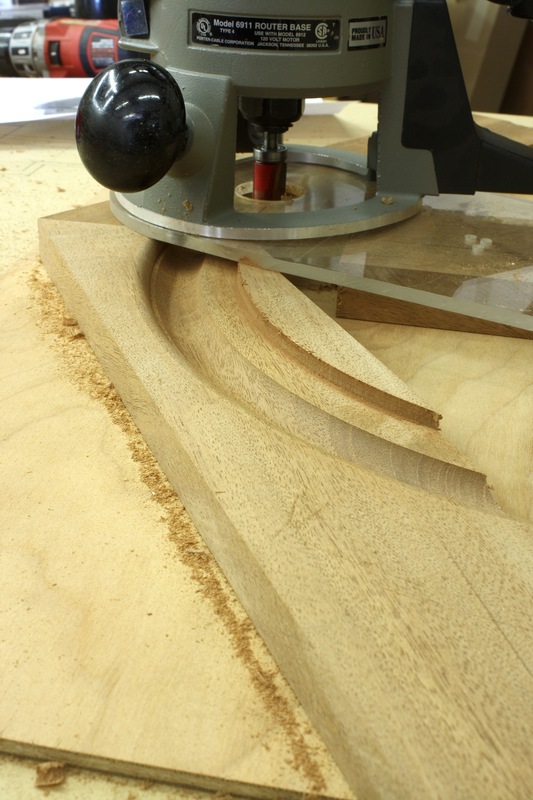 To do that in this scenario, I had to run at my router table, keeping the face of the mouldings against the table. The problem with bearing-mounted router bits is reach. On wide goose-neck mouldings, you often cannot reach back into the profile enough to make things work. On the Egerton moulding, though, that’s not a problem because it’s only 7/8″ wide. I was able to use the bearings on my router bits of choice to get the job done, so the first bit used was a cove design for raised panels. That router bit allowed me to reach back 3/4″ of the 7/8″ needed – that left an 1/8″ of flat at the top edge of my profile. On the straight runs, cut from end to end. On the curved work, you need to stop just short of the rosette area. The second profile I used was a simple 1/4″ round-over bit, but I switched out the normal bearing to use one that was a 1/8″ smaller in diameter. 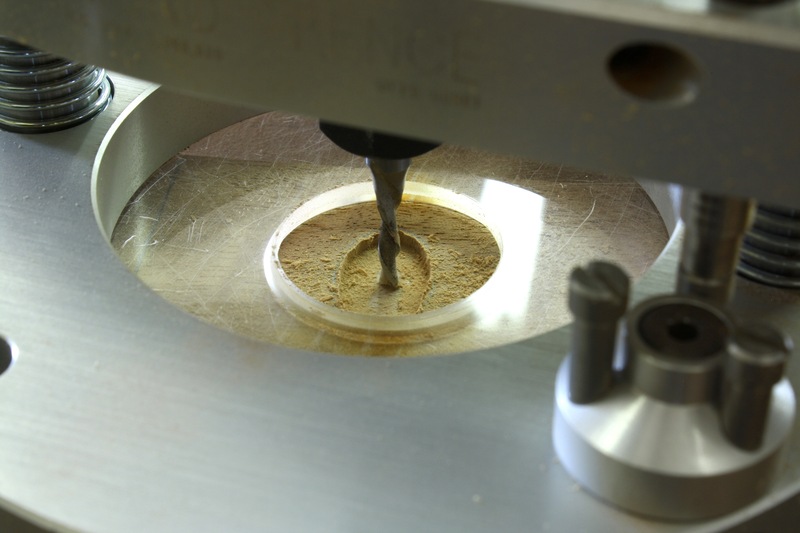 That change moved the round-over profile in slightly on the workpiece. Height adjustments need to be accurate. Because I was looking to flow the second profile into the larger cove cut, I found it best to sneak up on the final setting. I could have stopped at this point, but the square edge left after the second router cut was smaller than what I saw on the original clock profile. I wanted more. Deciding to make the last router-bit cut added the needed square-edge to my profile, but it also caused more work after routing work was complete. To achieve an additional 1/16″ of square edge for an 1/8″ total, I used a rabbet bit to push the design up into the moulding. That cut removed a lot of the round-over profile, but that would be easy to replace with carving tools, and the extra square edge made the design of my goose-neck more in line with the original. To complete the mouldings, both the curved and straight pieces, I use a couple carving gouges to re-round the profile. Work on the straight pieces was easy. I found and carved with the grain direction. On the curved pieces, carving required that I move in different directions due to the grain changing as the curves undulated. Even with that need, the work was not difficult. Next week I’ll show the completed and installed goose-neck moulding with the carved rosettes in place. I’m getting close to finished. After preparation for Woodworking in America and building a lowboy for the February 2014 issue of the magazine, I finally had the chance to get back to the tall clock. Inlay, both banding and pictorial, were fit to the hood, then I got started on the mouldings. I had a couple of snafus with which to deal, but otherwise things went as planned. 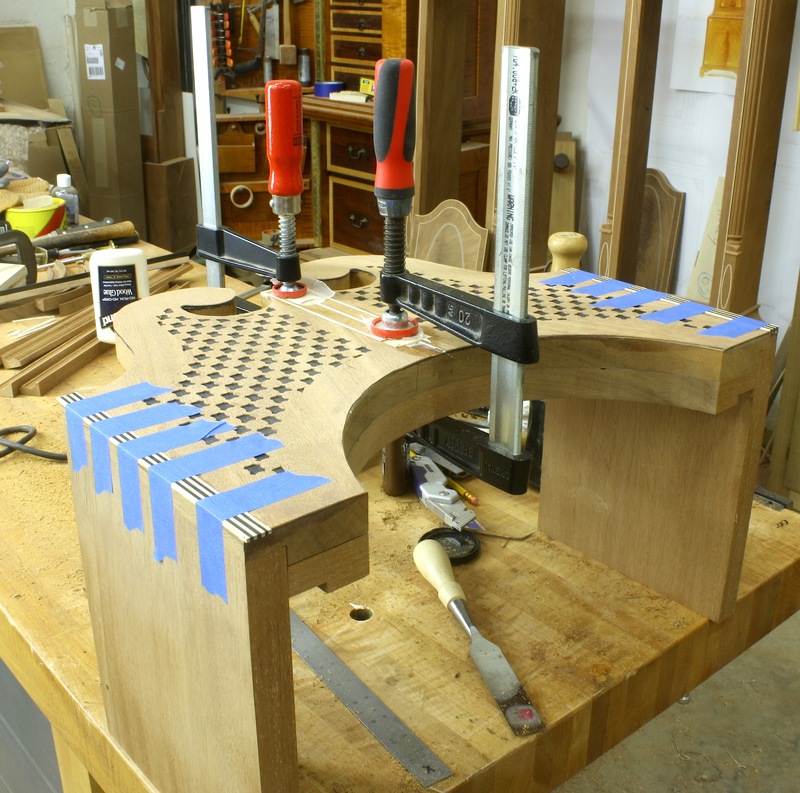 You would think that the bandings – straight pieces of layered ebony and maple – would be the easy work. That, however, is where I had a snafu. One side of the hood went like clockwork. The second edge was laid out just as the first, but somewhere along the line I made the decision to cut away my line instead of leaving it. As a result, I routed a bit wider than necessary. Because the banding is striped, I couldn’t just cut it wider. I had to slice off a couple of the lines then glue back slightly wider lines to make it work. In the end, it was wasted time, but nothing else. The center inlay was easy. (Read how I made “My Night Cap,” in an earlier post.) Being guided as to position by the design of the hood, I simply clamped the straightedge in place, set the router base tight to that edge and plunged the cut. 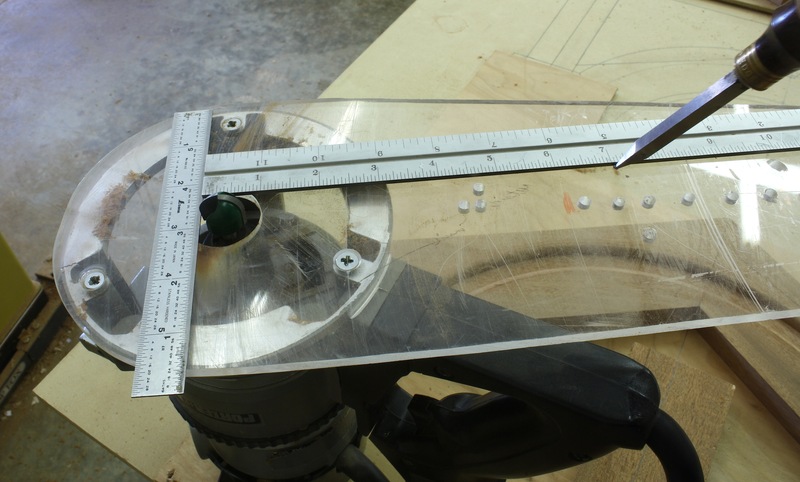 (No need for a plunge-cut router here; it was easy to tilt the base into the cut to get started.) After establishing one edge, I set the inlay tight to that routed edge and drew the opposite edge onto the hood using a sharp pencil. I then set up the straightedge to just cut inside that second-edge line. I routed the second edge then free-handed the router to waste out all the remaining unwanted material. Next week I’ll discuss the installation of the bottom-edge mouldings and the center keystone which has to have a small amount of inlay work done before I can stick in place. 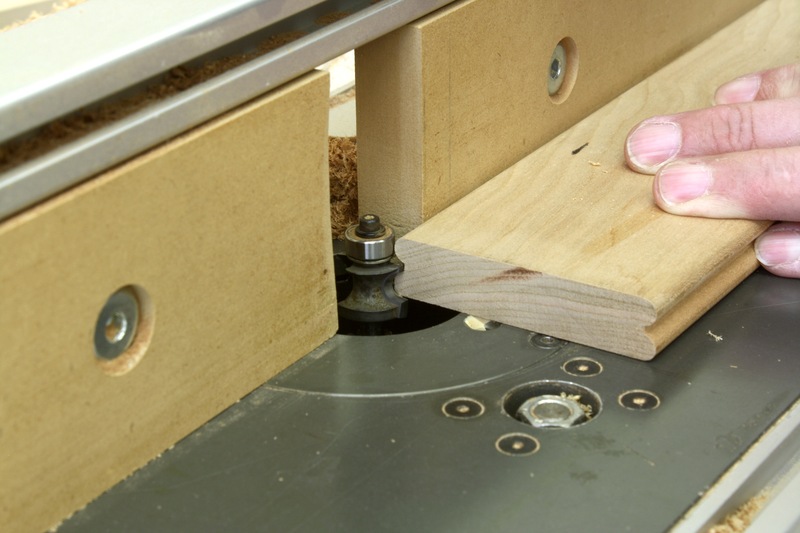 In a blended woodworking shop – how any woodworking shop should be set up – you make choices about when hand work is appropriate and when it makes better sense to use power tools. That decision should not necessarily be guided by a passion for any particular method or tool; as woodworkers, we face this whenever we hope to be productive in our shops. In a post a few weeks back (read it here), I wrote about how easy it was to make a simple scratch beader (scratch stock) to profile the arched moldings on the Egerton clock hood. With that project on hold while I build a cover piece for an upcoming issue of Popular Woodworking Magazine, I faced a similar choice as I made drawer molding for the transitional lowboy. (If you’re a furniture purist, don’t tell me I’m not suppose to use the term transitional – that best describes the project on which I’m working.) 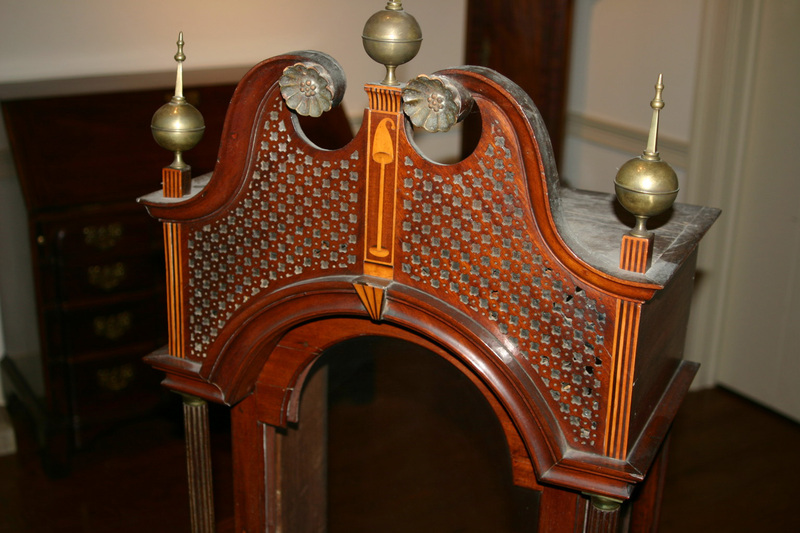 The moldings are a double-bead design that signifies later William & Mary period work. 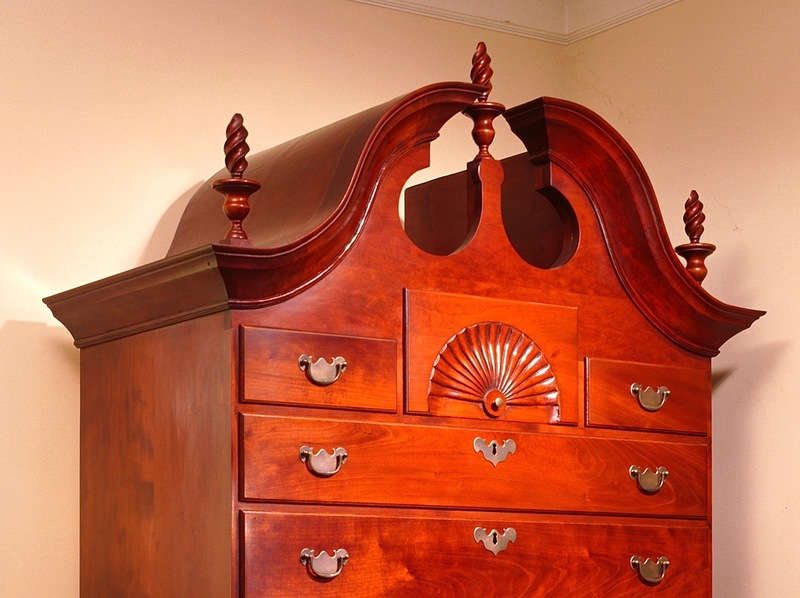 And the fact that the lowboy has cabriole legs (Queen Anne) also indicates a transitional build. I decided to make another simple beader, but this time the tool was a bit more involved. Not only did I drill the holes and sand the profile, I needed to set the blade into a handle to register the molding with each pass. Even with the handle added, making the tool was too easy. In order to use the scratch beader, I ran a slot down the middle of my stock using a slot cutter setup in my router table. At the bench with the stock set in my vise, I scratched the double-bead profile into the edge. At my table saw, I set the cut for 1/4″ then ripped the first piece of molding free. Everything worked, but the process to get six pieces of molding was too long. 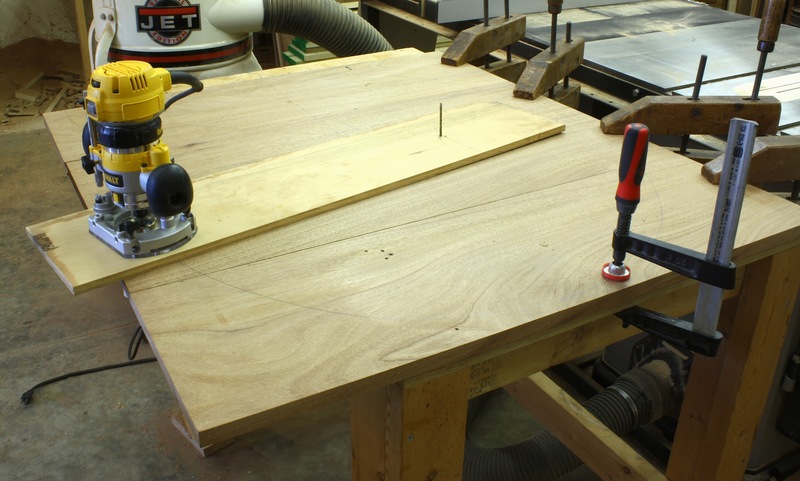 Using my router table with a 1/4″ corner-beading router bit installed, I ran a pass to form the bead, flipped the stock to rout a bead at the opposite face, then ripped the molding at my table saw. I was easily convinced that this was the process I would use. But what guided my decision? First there was the ease of the entire process. Router cut was far easier and quicker than walking through the steps needed to do the work by hand. Also, the pattern or profile was consistent with each piece of molding cut. This is important because there are a couple of places, as you can see in the opening photo, where these molding pieces meet and intersect with one another – matching profiles are easier to fit and blend (hand-cut work can require further shaping and sanding). What did I give up? The original molding profile I was after was a 3/16″ bead at each edge of the 5/8″-wide stock, with a 1/4″ of flat between the two beads. What I made using power tools was a 1/4″ bead at both edges with an 1/8″ flat – not the same design. I could have found and purchased a 3/16″ corner-beading router bit, but I didn’t think it was that important. 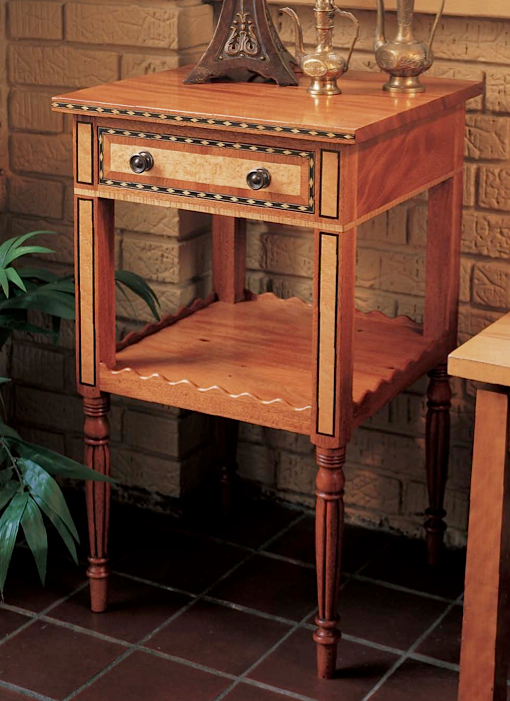 If this was a customer-purchased lowboy, I would have built the piece with the 3/16″ beads. But given the fact that it is a piece for me – as most of the projects you build are for you – I opted to be more productive in my shop. 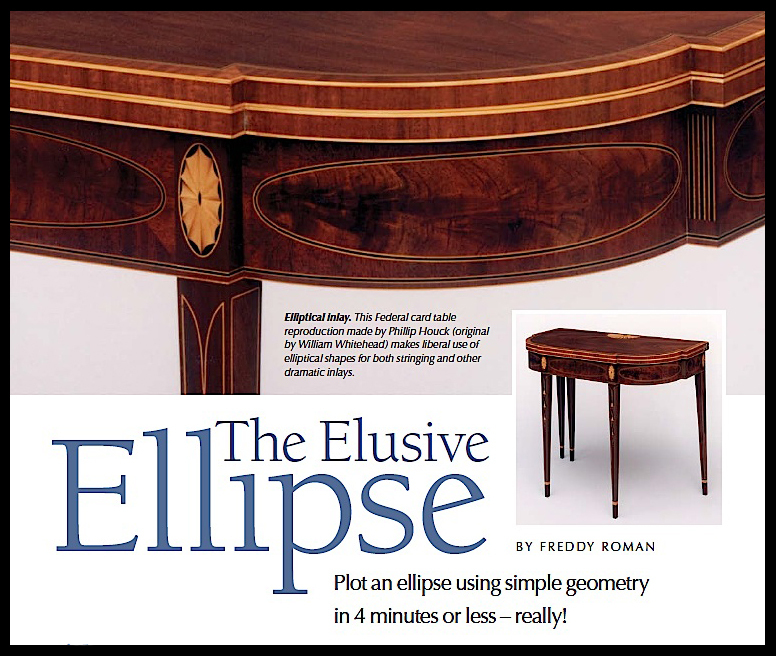 In late 2010, I listened to furnituremaker Fred Roman talk about ovals and how to lay them out using geometry. I had always used a string method in the shop, and when I was in the home-building field, we used two framing squares. These days I use SketchUp. A couple of adjustments were made to the jig so we cut exactly at the layout lines, and so the jig could spin without any interference from the clamps used to hold the top. Everything was set and ready to go, so Dave powered up the router and made a light pass. The depth of cut was 3/4″ so we set up to make the entire cut in three steps, and he cut only half of the top. When we finished that half, the top was spun so the remaining half hung off the table and the step process was repeated. The cuts were perfect. In fact Dave wanted to setup and cut the ends the same way, but I persuaded him to cut those at the band saw and clean the edges using a disc sander. While he (and you) could do that, I think it’s much easier to trim the second radii so you don’t nick into the already cut edge. There’s no sense in taking the chance given the leaves of his table were easily cut at the band saw. The entire process worked like a charm. 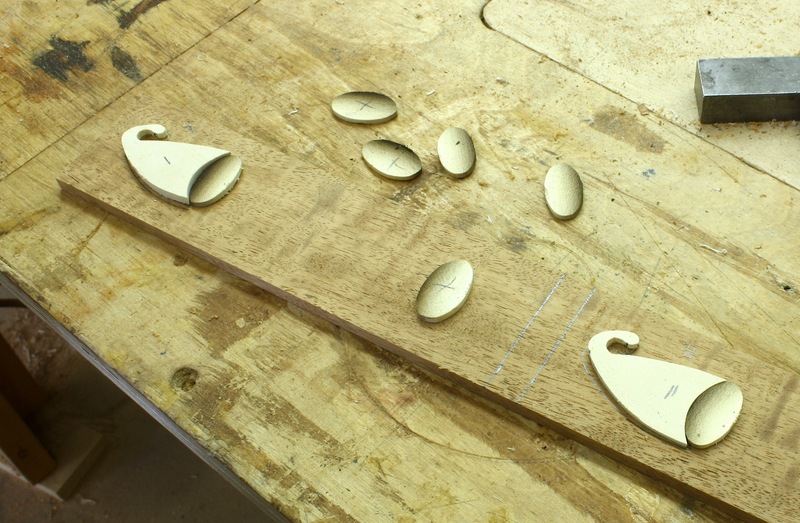 I will use it over and over when I run into ovals – large ovals – in my work; small ovals are too easily cut using my band saw. I included the photo below to show you the nifty clamping method we used to hold the arced edge for the second set of cuts. 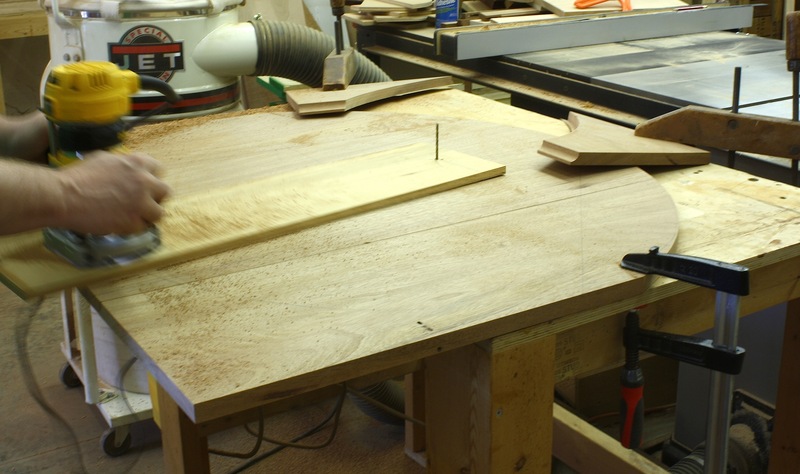 Our clamps could not reach the workpiece, so we lapped pieces onto the tabletop then clamped the scraps in place. This is a handy trick in a pinch. There are times when I need to get into the shop just to have fun. That time generally rejuvenates me so I can get back to my projects with a renewed vigor. If that fun time also happens to be something I need for one of my projects, I consider that a bonus. This week was a bonus. I needed to make a piece of inlay for the tall clocks. In the photo you can see, on the original Egerton clock, the piece of inlay I needed to make, the Night Cap perched on the post. This post is more pictorial that text filled, but you know what is said about a photo. Step one was to develop a pattern for the inlay. I could have drawn the design free-hand, but it’s easier to pull the image into SketchUp and trace over the lines. After I had the plan, I spray-glued the images onto a piece of scrap holly and cut the pieces at my band saw. When I had the pieces cut out, I smoothed the edges as best I could using a disc sander and fine rasp before moving on. I also made sure the two pieces fit together nicely. I wasn’t worried about a super-tight fit because the separation would better show the delineation between the two pieces. Using a bench hook, I sawed the pieces into thin, usable slices. I like my Japanese saw for this cut. 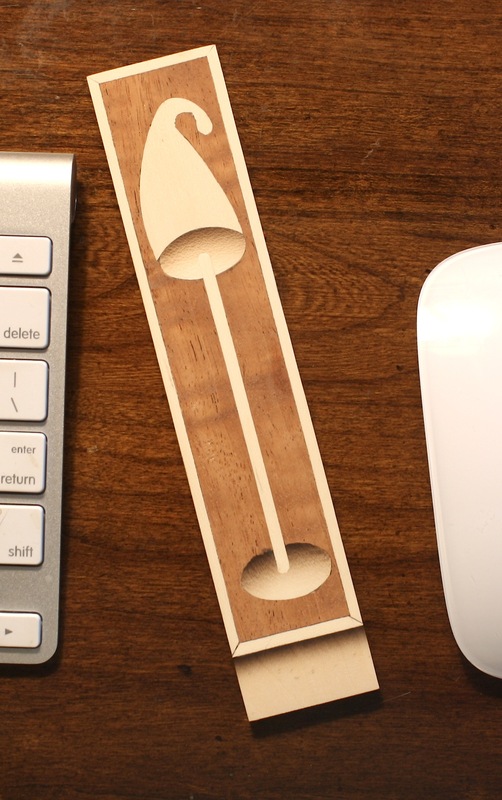 It’s thinner kerf saves material, and the small, finer teeth make the task easier. Sand-shading is great. There are few techniques as simple as this. And the results add a crap-load to the overall look of your work. The only pieces in this design that get shading are the small ovals. To inlay the pieces into my stock, I have to excavate the waste. This is really where a router becomes valuable. I positioned the pieces to my backer, then carefully traced around each piece with a sharp pencil. With a 1/16″ straight bit loaded into the tool, I set the depth of cut then hogged out as close to the lines as possible. With the areas cut away and trimmed to an exacting fit, I added glue into the recess and hammered the inlay pieces into place. The rod for the Night Cap holder couldn’t be easier. I used the same 1/16″-diameter bit, set the workpiece flush with the edge of my bench then used a guide fence on the router to cut the line. 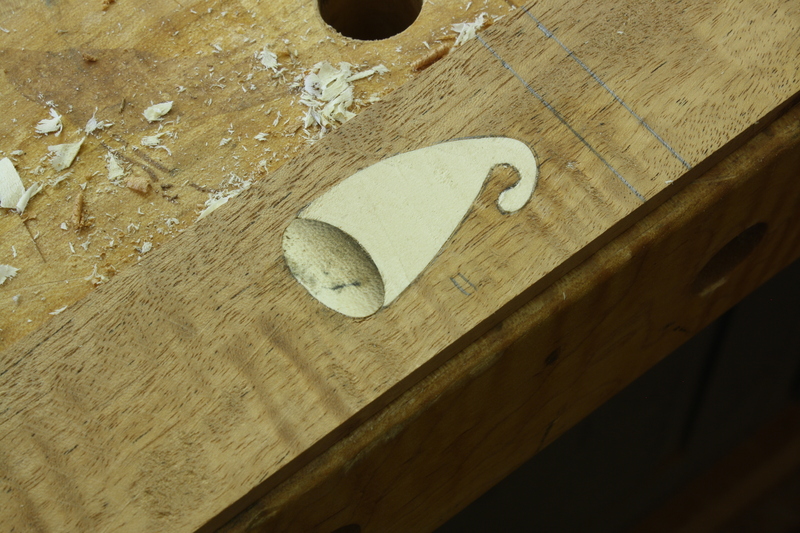 The rounded ends from the router bit worked great against the small ovals to complete the design. A piece of string was cut to fit, a small amount of glue was injected then I hammered into the recess. At my table saw, I set the fence and raised the blade to trim the edges for more string banding. The pieces were cut to size and I mitered the corners using the reflection in the back of my chisel to set the angle – too easy. Glue to hold and blue tape as a clamp, then let it dry. 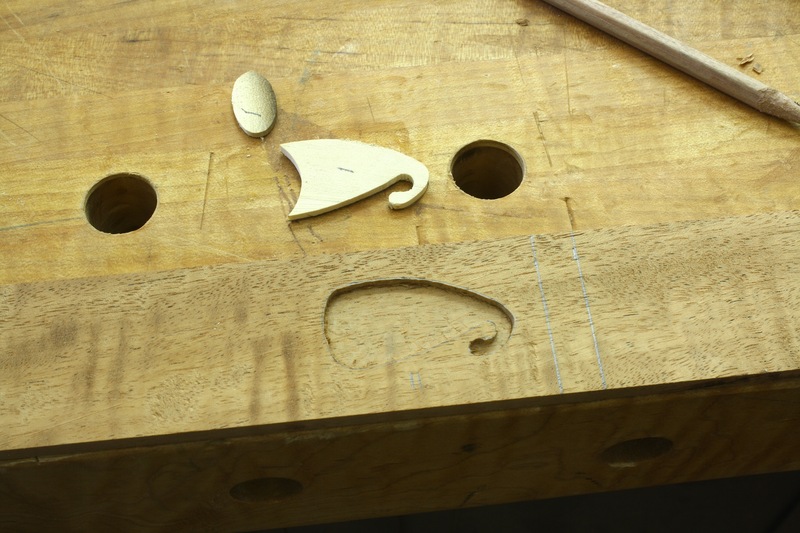 With the glue dry, I sanded each face – I built two of the pieces – then cleaned up the edges with my block plane. Before I install these on the clock hood, I’ll thin the assembly somewhat. The two pieces are a bit different. So, are the results perfect? No way, I wouldn’t expect that. Was it fun to do? Hell yes. Every once in while you need to get into the shop to just have fun. I’ve returned to the Egerton tall clock this week to begin work on the hood moldings. Due to the dial design selected, this clock has a circular molding that is cut at an angle to fit to straight runs before it turns back the sides of the hood. 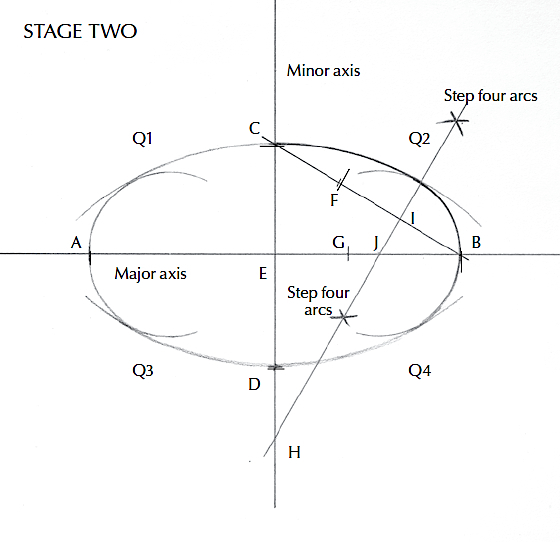 I’m beginning with the arched section because it’s easier to produce a match when working on the straight runs, than it is to work up a perfect match on the arched section after the straight stock is made. 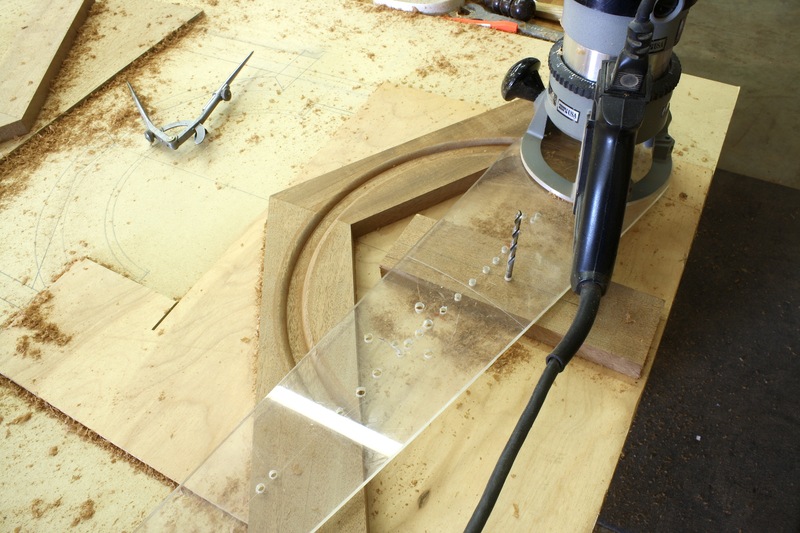 For this operation, I find it best to use my router along with a circle-cutting jig. You find the radius of the cut, which changes with each router bit used as you make the profile, then swing the setup as you make your cuts. 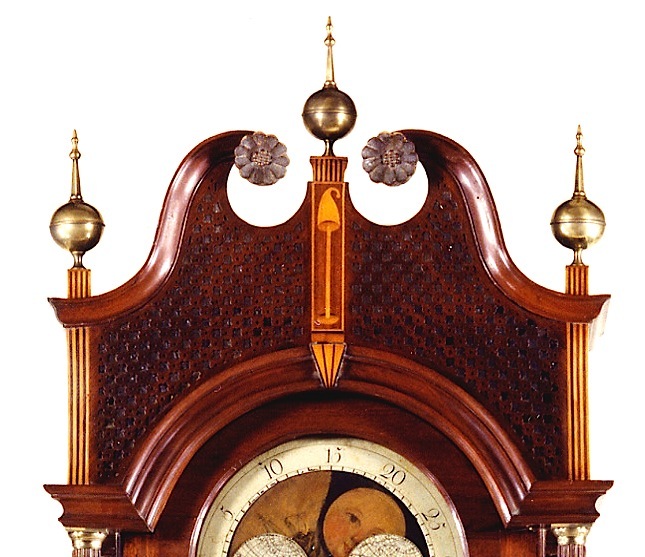 For this clock, because there is a small added inlaid piece up the center of the hood, the arched molding is divided. 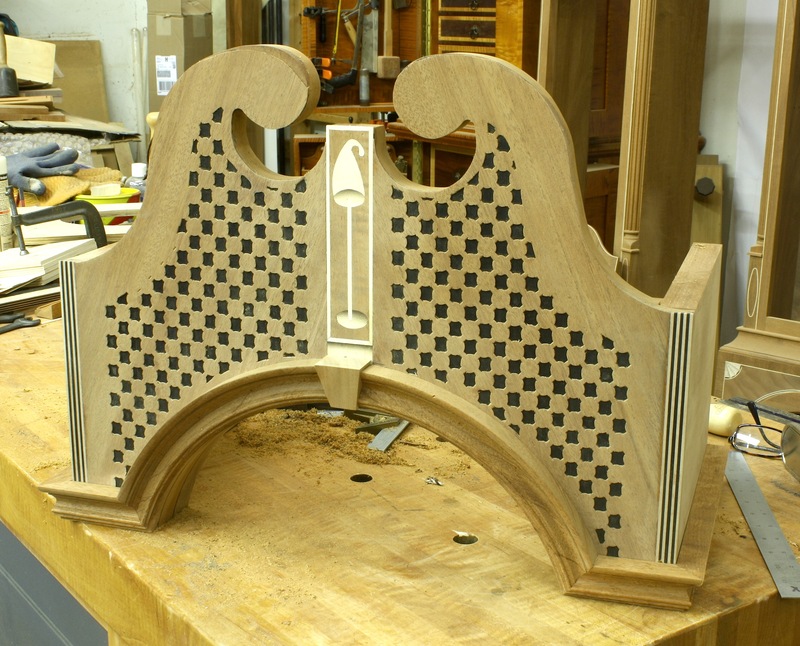 That allows me to set up the stock as a pair of pieces instead a single piece with the entire arch cut. This translates into stronger moldings because there is no short grain where the piece can easily break. In the photo above, you can see the setup. I have my router attached to a shop-made circle-cutting jig and yes, that is a drill bit I’m using as a pivot – no right-sized dowel in the shop. (Make do with what you have.) 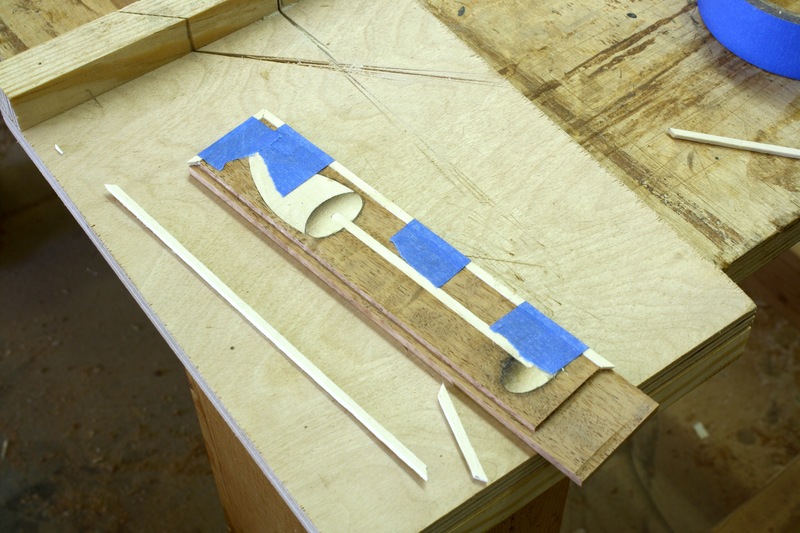 In the photo I’ve made the first pass, creating the thumbnail profile along the top edge of the molding. The workpieces are held with double-stick tape, as is the pivot platform. 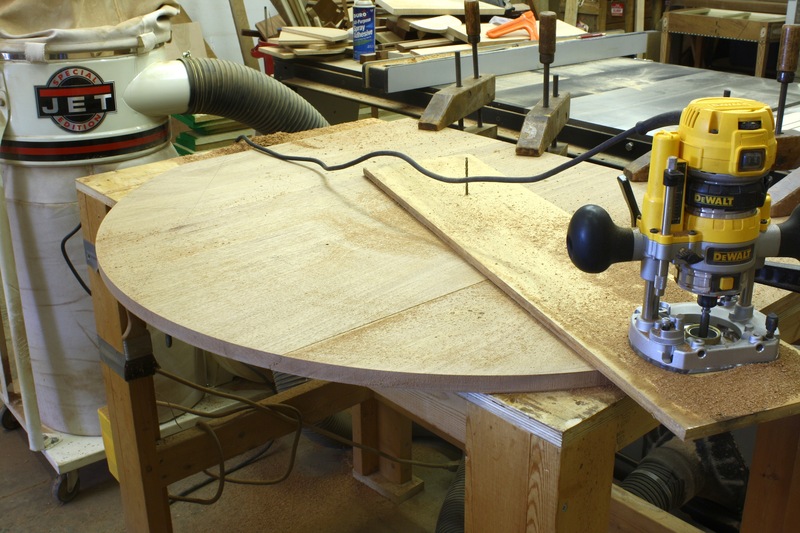 The trick to this work is to properly set your router and the length of the jig to cut exactly where you need to produce the profile. 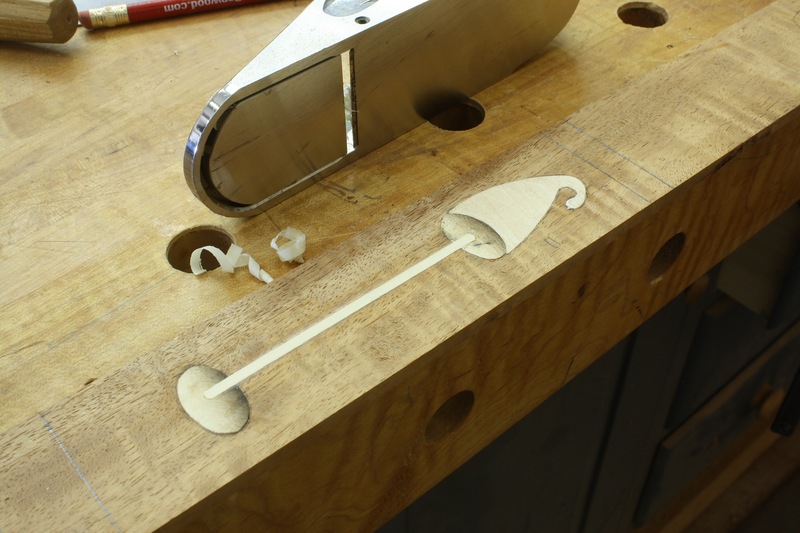 To do just that you need to accurately measure for the hole location (pivot point) on your jig. As you can see in the left-hand photo, you don’t need to be centered of your jig. 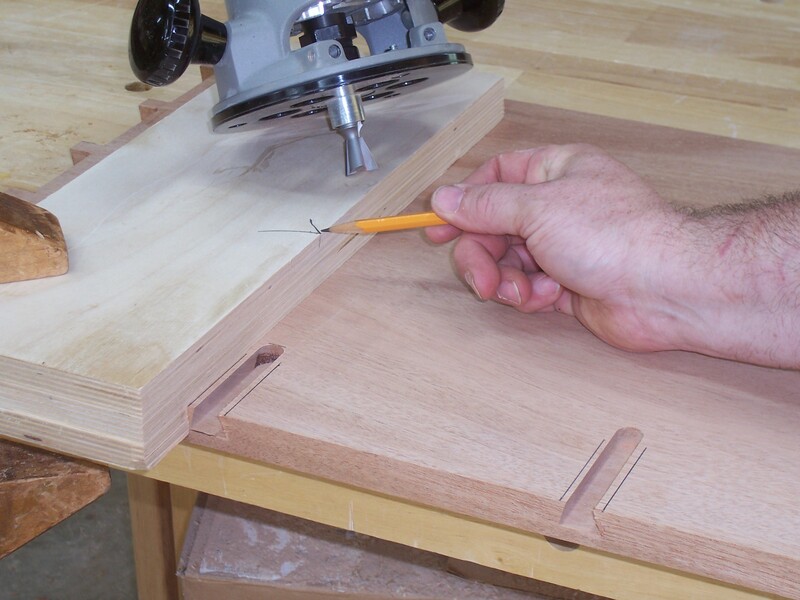 As long as the measurement from the pivot to the correct edge of your router bit is right, your cut will be in the correct location. There are times when you’ll set to the far side of the bit and times when you use the near side to cut your profile. Once determined, I use a bird cage awl to start my hole so the drill bit stays put as I drill. It takes some time to get the position just right, but it can be done. 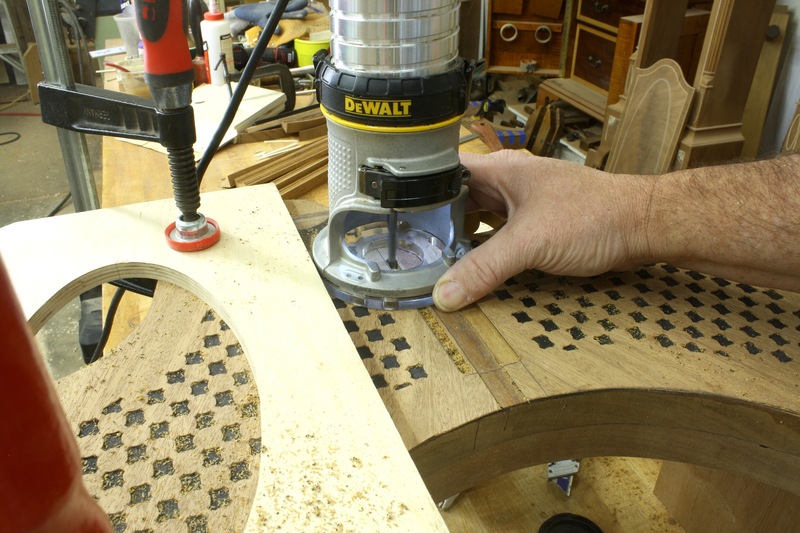 The results are great if you use the correct router bits and get the setups just right. In the right-hand photo you can see the results of three passes using the setup. The first was the thumbnail. For the second cut I used a round-nose bit. The third cut was with a straight bit and it was simply to clear the material for the subsequent passes. It was after the third pass that I realized I had used the wrong round-nose router bit. The width of the round-bottom trench was too wide for the profile as I had it drawn. You know what that means, right. Yep, start over. I’ll choose the right bits this time, and I think I’ll re-design the molding somewhat; I wasn’t thrilled with how it was coming out. Also, because it is time-consuming to accurately position the jig, I’ll switch to my Micro Fence circle-cutting jig which allows me way more accuracy as I work. That’s my Sunday (another day in the shop, yeah). What are you planning? This year my classes are all over the map. I open the conference teaching a seminar titled, “Better Woodworking Through Proper Wood Prep.” The most basic observation I can give you is that if you begin a project with warped wood, you will fight it throughout the entire project. You need to make sure you know the basics, so of course we’ll cover the basics and you can bet there is way more. I’ve spent 20 years milling wood for projects. I’ve learned a crap-load of tricks and techniques to make the work easier and to mill lumber that is bent, twisted and just plain gnarly. 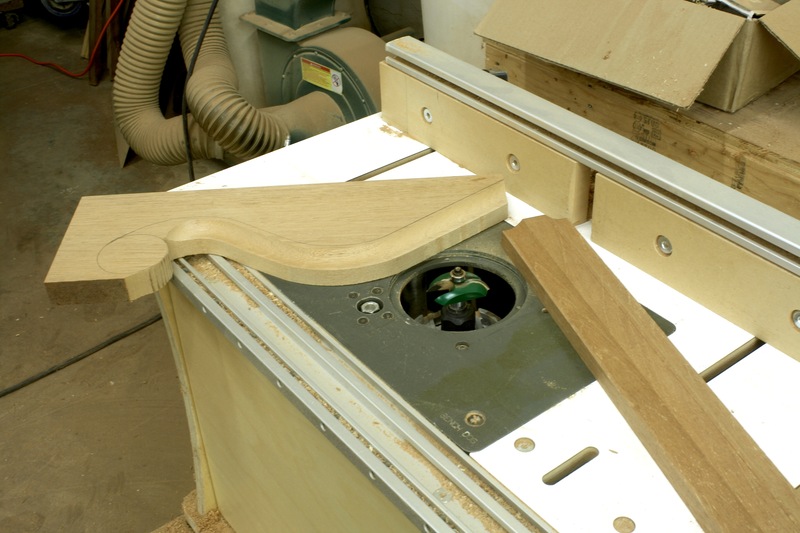 In addition to the basics, I’ll share how to read your stock, what corner to press and when to straighten twisted stock, cup up or cup down and what to do if your board sticks at the jointer. This one class can make your time in the shop better. Another class I’m teaching is “Precision Joinery: In a Hurry.” In this area alone, you discover why you need to be a blended woodworker. The class description from WIA says it best, “No single hand tool, power tool or machine is best to produce all the requisite joints. 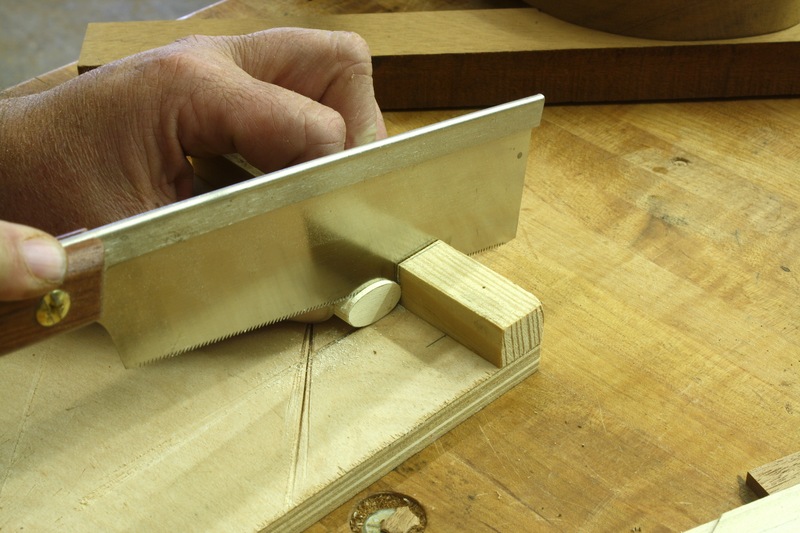 To make parts as quickly and accurately as possible, you need to know what tool to use when.” I’ve got jigs that make my life in the shop easy and highly productive, but I also know when to turn to my hand tools. During the class we’ll look at a number of furniture joints and I’ll share my best techniques. 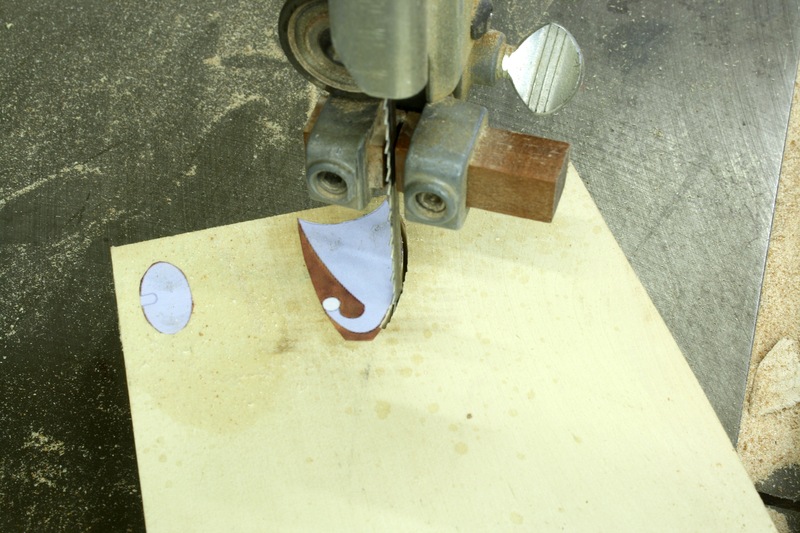 On Sunday at WIA, I have a three hour class on inlay based around Federal-style inlay. Be sure to attend “Understanding Inlay: A Key Piece in Connoisseurship & Identification.” If you study inlay you’ll discover that each major city center had its own distinct inlay designs. One of the most famous (and often miscategorized) banding is the lunette inlay often associated with John and Thomas Seymour in Massachusetts. 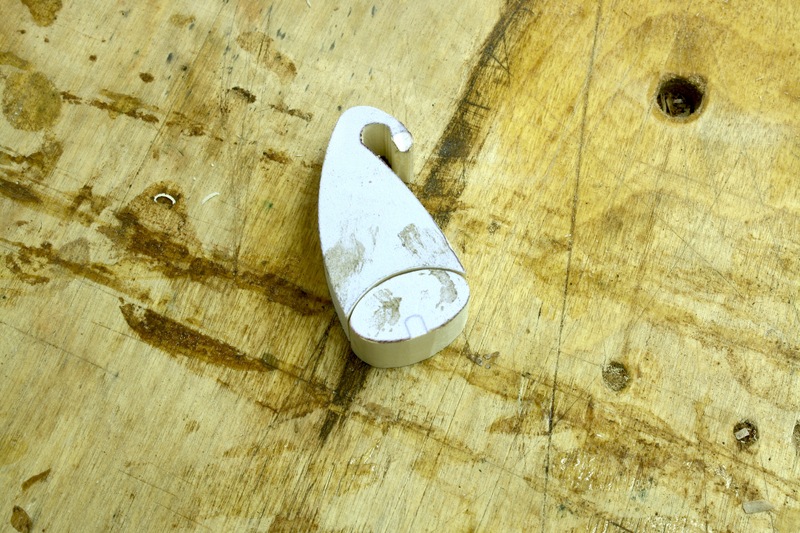 Every banding, inlay and patera is a clue to where the piece was built. Not only will we learn about different inlay and bandings, but I’ll demonstrate how many of these bandings are assembled. And before the class is over, you’ll be given the opportunity to make a sand-shaded fan that you can inlay into your project. So come ready to learn and ready to work, too.